Dale Four Panel 12 Inches Wide Abdominal Binder is clinically proven to expedite the return of pulmonary function after open abdominal surgery while encouraging patients to ambulate sooner. 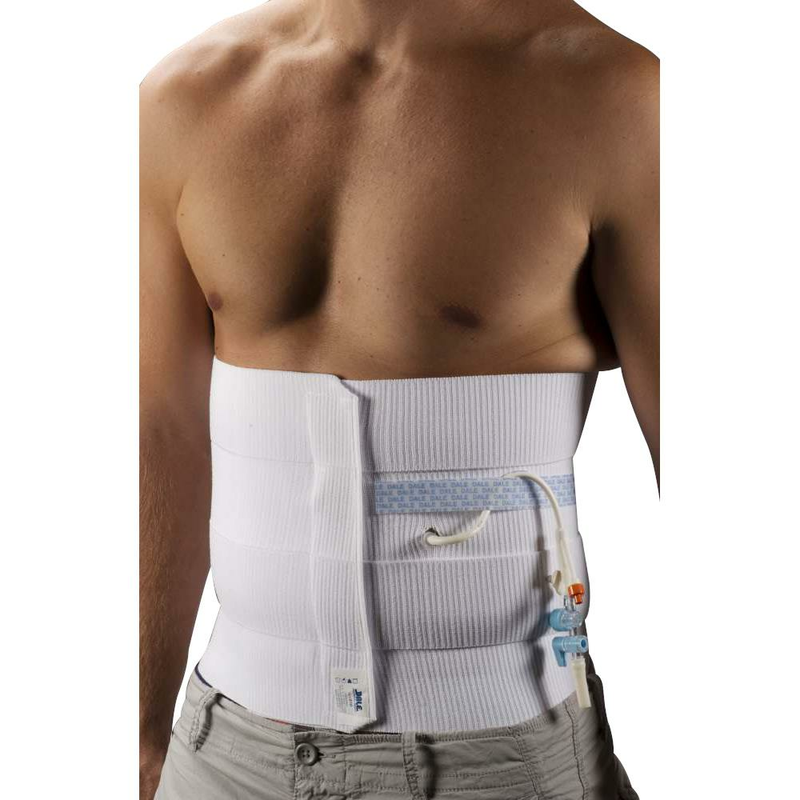 Dale Abdominal Binder supports abdominal muscles while encouraging mobility and promoting muscle redevelopment. It is made entirely of an exclusive stretch material, which permits hook and loop closure at any point for more precise and comfortable fit. Place the binder under the patient and stretch one end out. Proper stretch provides necessary compression. Stretch the binder over the patient stomach and hold with one hand. The binder may be placed straight, or at an angle if additional pressure is needed on the upper or lower abdomen. Stretch the other end over at the desired angle. Press the binder closed while stretching. Be sure to stretch the binder adequately. Remember, a secure fit would not restrict breathing; the stretching and compression actually facilitates deep breathing. Position top edge just below navel and stretch out sideways. A hole can be cut in the Dale Abdominal Binder to accommodate tubes such as draining and feeding. Place the binder on the patient so that there is only a single thickness over the draining site. Mark an X on the fabric where the hole should be made, crease the fabric and make an elliptical cut in the material. When the fabric is stretched, the elliptical cut will become around hole to accommodate the drain. The diameter of the hole will be equal to the length of the cut. For drainage bulb use, thread EasyGrip Strip through drainage bulb tab; reattach to binder. Machine or hand wash in cold water with mild detergent. Before washing, make sure that the hook and loop surfaces are securely fastened to prevent lint accumulation, which can interfere with the fibers and weaken their locking properties.